A waterjet cutter is a tool capable of slicing into metal or other materials using a jet of water at high velocity and pressure, or a mixture of water and an abrasive substance. The process is essentially the same as water erosion found in nature but accelerated and concentrated by orders of magnitude. 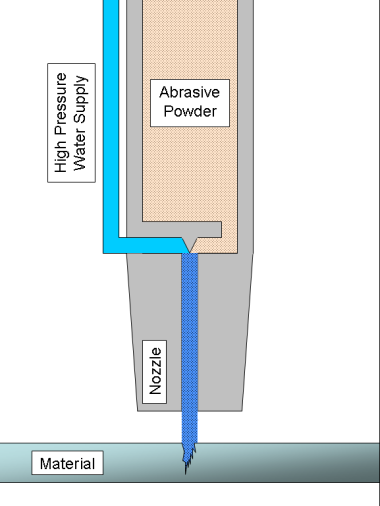 The cutter is commonly connected to a high-pressure water pump (a local water main does not supply sufficient pressure) where the water is then ejected out of the nozzle, cutting through the material by bombarding it with the stream of high-speed water. Additives in the form of suspended grit or other abrasives, such as garnet and aluminum oxide, can assist in this process. Because the nature of the cutting stream can be easily modified, waterjets can be used to cut materials as diverse as fish sticks and titanium. There are few materials that can't be effectively cut with a waterjet cutter; one of these is tempered glass which shatters when cut, regardless of the cutting technology used. The most important benefit of the waterjet cutter is its ability to cut material without interfering with the material's inherent structure as there is no "heat affected zone" or HAZ. This allows metals to be cut without harming or changing their intrinsic properties.